I'm probably a terrible judge of survival games. My résumé includes dozens of hours spent in Minecraft and Terraria, but outside of those, I've only done a little occasional dabbling. There will come a time when I'll give my soul over to Don't Starve, but that time has not yet arrived. However, Terraria stands as one of the best video game experiences I've ever had, and its effect on me is why I'll always be interested in the genre. Minecraft proved the potential for success using the early access business model, while also showing how far a game can go by letting its fans help with the design process. The games following in its footsteps depend heavily upon player input, which in turn means those players must be both confident in the development team, and used to waiting for updates. Which brings me to the latest game from independent developer Forged Chaos, Trials of Ascension: Exile. If you clicked that link, you'll notice the game is in pre-early access on Steam, meaning it's currently unavailable for purchase. I was fortunate enough to receive a press code for the game through its community manager, allowing me to join a group of fans and "influencers" online, before it becomes widely available. Trials of Ascension: Exile is both familiar and foreign to me. Having put some serious time into a few of the seminal games in the survival genre, I thought I knew what this game would be, before I'd ever played it. I was both right and wrong, and although my playing experience would qualify as "mixed", I'm very much compelled to see more. Most of the traditional survival genre tropes are present within the game. Before playing, players decide on a server to join. Gameplay involves lots of foraging, mining, and looking for resources to... survive. There are light combat mechanics, but nothing so intense that it suddenly turns this into an action game. This blueprint thing kind of blows my mind. Exile differentiates itself in two big ways. The first is its playable races. 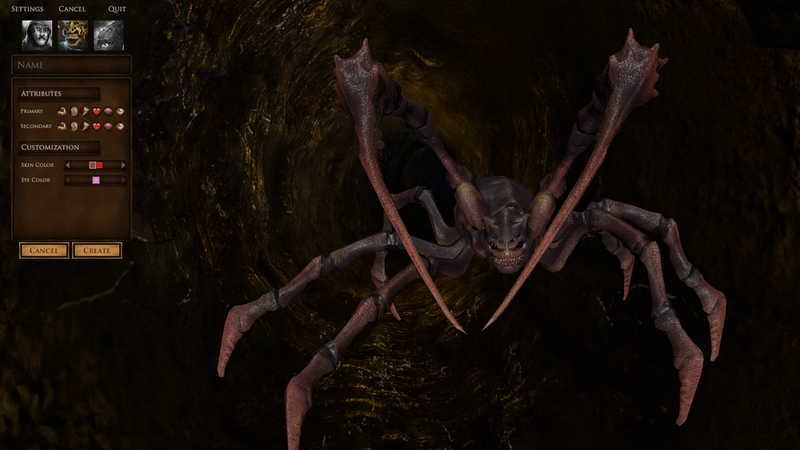 Players can choose between playing as humans, dragons, or the raknar: a race of giant, murderous spiders. Each race has different survival mechanics and goals for progression. Humans are the only race capable of crafting. Materials they gather can be combined to make tools, torches, weapons, and armor, as one would expect. But they can also be used to build structures. From what I've seen both in-game and in trailers, there's an almost The Sims-level of detail when it comes to building shelter. Players place a blueprint and build homes based on that, rather than simply stacking blocks or choosing a pre-made building, spending some resources, and watching it spawn. There are some obvious drawbacks to playing a human. Like us real people, they have to find specific water sources or prepare sea water to make it potable. They need weapons for combat. They're also incapable of seeing in the dark. These are all great reasons to play one of the other races. Dragons spawn as hatchlings, which creates a very interesting ecosystem within Exile. 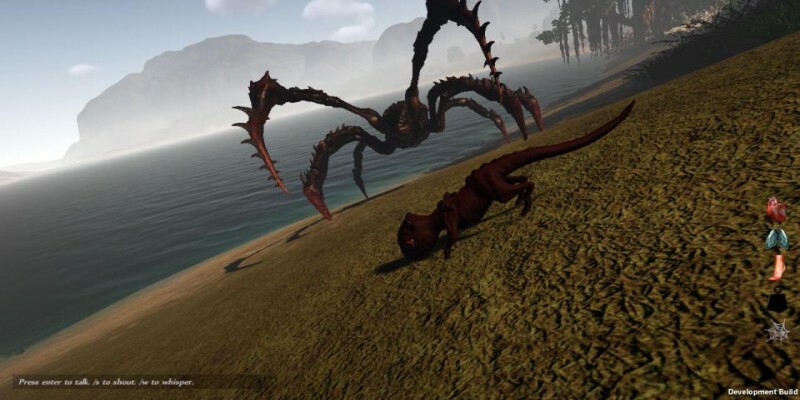 Hatchlings are reportedly the weakest starting race, and they have very few abilities. The idea is that players who can survive long enough to grow into adulthood as a dragon will eventually be the most dominant race. Older dragons can fly, breath fire, and otherwise do the awesome stuff one associates with being a damn dragon. Hatchlings... let's say they require patience. The raknar are likely the easiest starting race choice. A brand new raknar character is already a giant spider with sickle-like forelimbs. They don't really have to do much gathering, can eat basically anything as far as I've seen, and can place climbable webbing. I'm assuming that a fully-grown dragon can cook a raknar whole, but the later dragon evolutions are not yet in this version of the game, so these appear to be the top of the food chain for now. It's worth noting that my favorite thing in the game is the tooltip for raknar, which mentions they have "the potential to evolve into a perfect killing machine." Such is life as a giant spider with knife-hands with spikes on 'em. I'm rather fond of the teeth. I also like how the forelimbs have spikes, just in case. The addition of unusual race dynamics goes a long way toward making this game more interesting than the phrase, "open-world, multiplayer, survival game" would imply. For those who want that traditional "build a torch, build a pickaxe, build a campfire, eventually build a house" progression, humans provide that. But the other two races allow for a different perspective on the world, and it's predator/prey relationships. There's something truly novel about playing a survival game with a brand new character, and not needing a torch because you're a giant murderspider with night vision. The second major point of uniqueness in Trials of Ascension: Exile comes in the form of its presentation. The game is presented as a traditional 3D landscape, meaning it forgoes the terrain deformation common in games like Minecraft. This world and its inhabitants aren't made of blocks and that means it's much easier on the eyes than most survival games. Even in the early access, the game shows some realistic lighting effects, a convincing day/night cycle, and an impressive texture resolution. Very few survival games I've seen have any sort of noteworthy visual fidelity, so Forged Chaos deserves credit for already having a decent-looking game at this point in the development process. Despite the unique twists, this is still very much an early access game. The build I'm playing has very clear room for additions and improvement. Character growth systems are hard to interpret, which is a real letdown when you're receiving pop-up messages saying your botany skill has improved, but have no idea how that affects your play. There are UI elements that could really use an upgrade. Due to a lack of visual cues within the environment, I often found myself just holding the 'W' key, hoping I'd see something useful to my character. Overall, playing Exile today feels like playing an ambitious, but very unfinished game. That said, that's the point of early access. The developers are taking direct player feedback, even going as far as playing on servers with the fans, while engaging them in Discord voice chat. It's never obvious how any game will turn out (early access or otherwise), but this one seems to have the right combination of good ideas, a transparent dev team, and passionate fans to truly stand out. During my first play session, I sat in on one of those voice chat sessions, and heard players speaking about specific sound effects and animations that had been improved over the last few days. The developers immediately responded explaining those changes in detail. It appears to be a functional relationship, one of the keys for an early access game's eventual success. Trials of Ascension: Exile joins Steam's early access program July 26, 2018. Until that time, you can check out more media for the game on their official website, or, of course, see what we have to say as the game's development continues. I plan to stream more of it in the near future, too. Image sources: gameplay screen captures and their Steam product page.